Surveillance video shows the Mercedes drove past the stop sign, hitting a Ford Ranger pickup truck. 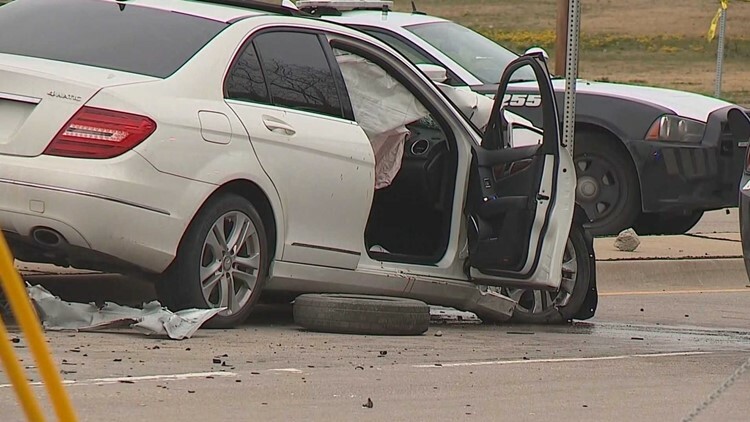 DESOTO, Texas — Police are asking your help with any information on a crash that critically injured an innocent driver early Friday afternoon. According to DeSoto police, the crash happened shortly before 12:30 p.m. at the intersection of Danieldale and Polk Street at the Dallas-DeSoto border. An initial investigation indicates a white Kia Forte car was chasing a Mercedes Benz C-class vehicle as they approached a four-way stop, heading northbound on Polk Street. Surveillance video shows the Mercedes drove past the stop sign, hitting a Ford Ranger pickup truck. One person in the Ford Ranger was taken to the hospital in critical condition, and two people in the Mercedes were also sent to the hospital. The white Kia stopped briefly at the intersection, then continued driving, heading westbound on Danieldale Road. Police said that gunshots were fired from one of the vehicles involved in the chase. Anyone with any information should contact the DeSoto Criminal Investigations Division at 469-658-3050 or Dallas police.